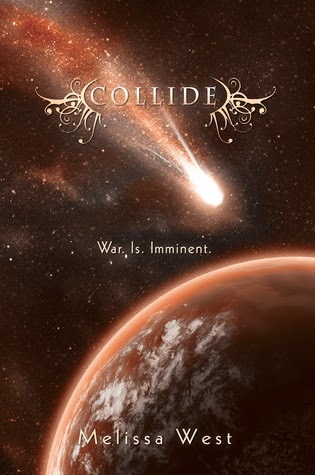 Review: Collide is the third and final book in West's The Taking series and with the insane cliffhanger Hover ended with I was really happy to finally get my hand on Collide to see how everything works out for Ari and Jackson. Ari is back on earth and things have changed drastically, there is new leadership, Earth is in a very bad state and things are just very intense with the anticipation of war coming. What I loved the most was Ari and Jackson's relationship. They have this bond and respect for each other that I really admired. Jackson lets Ari do her thing and supports her through all her decisions. They both trusted each others skills in doing what needed to be done without holding the other one back out of their fear for the other ones safety. Zeus was still twisted as ever he was constantly messing with Ari and I'm pretty sure getting some sick pleasure out of it. As far as the plot goes it moved very fast, lots of betrayals and moments of "you think you know what is going on but you really have no idea." I do wish the final face off with Zeus didn't happen so quickly, there was such a big build up and then it was over just like that. I also didn't understand what was the purpose of introducing a new alien species at the end I don't feel they served a real purpose. The whole time I was reading Collide I just felt like it was lacking something it's hard to put my finger on what exactly but overall I still liked it and really enjoyed the series as a whole.